Fig. 20. Erysimum multiple (left - flower). Erysimum absent-minded, Erysimum gray [Erysimum diffusum Ehrh. (Erysimum canescens Roth)] - cultivated plant. Heart glycosides from the grass treacle - erisimi and arithematic, used as a cardiac tonic in the acute and chronic insufficiency of the cardiovascular system with severe circulatory disorders. 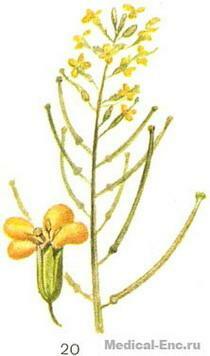 The treacle mustard (Erysimum cheiranthoides L.) is a wild plant. From the grass get cardiotonic preparation of COREid.